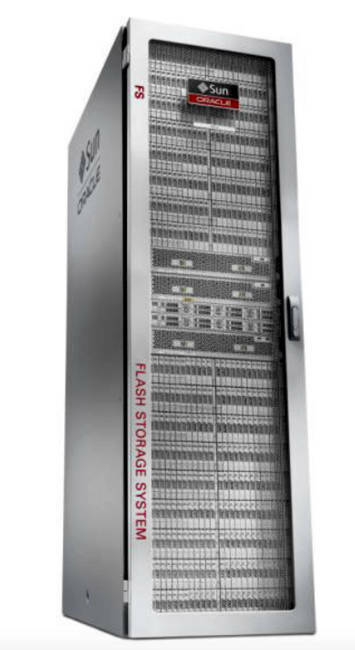 Oracle has booted out the disks in its FS1-2 hybrid flash/disk FS1 array to create the all-flash FS1, a 2-tier flash array scaling from 2TB to 912TB of capacity with "the lowest entry price of any all-flash enterprise-class storage solution." Oracle and low prices; who'd a thought it? The original FS1 1s a scale-up dual-controller hybrid flash/disk design that scaled to 912TB of flash and up to 2PB of disk capacity. The flash uses 400GB or 1.6TB drives. Users can cluster 8 high-availability FS1-2 pairs together. The all-flash FS1 is is a scale-up, two-node design, with a processing complex using from one to thirty JBODs (Just a Bunch Of Drives) shelves, each with 24 x 2.5-inch drive bays filled with SAS-2 SSDs. In other words it is a classic dual-controller array design, like the FS1-2, and appears to be simply an FS1-2 with its disk drive enclosures taken away and the 30 x 2U drive enclosure scale-up scheme retained. It scales from 2TB to 912TB, exactly the same as the FS1-2's flash scalability, with performance flash for "database indices and application metadata" and capacity flash for "mixed workload scaling." There are two performance SSD drive enclosure layouts: thirteen 400GB drives for 5.2TB or seven 400GB drives for 2.8TB. We are not told the type of flash in each SSD or their performance characteristics. We are told the array has "sub-one millisecond latency when running simultaneous workloads across small to large block sizes with up to 8x faster IOPS and 9.7x faster write throughput than EMC XtremIO." No actual IOPS or GB/sec bandwidth figures are provided. In contrast, Oracle said the FS1-2 could deliver up to two million random read/write IOPS in a 50:50 mix, and up to 80GB/sec of throughput. With 24 drives at the front of each enclosure there is a shed load of space for other items, such as in-enclosure controllers as well as IO kit. What we're getting at is that there must be a lot of intelligence in each enclosure as the TB/U density is low. You could physically pack sixty or more SSDs into a 2U shelf it it was just a simple JBOD design. Either the enclosures are empty or there is a lot going on behind the SSDs for data protection and integrity, wear-levelling and so forth. Oracle does not say data is moved between the two tiers, nor does it say data isn't moved. We imagine it is; the FS1-2 is a hybrid flash/disk array with data movement software ,after all. The company adds that the system supports the running of hundreds of Oracle databases and provides consistent performance for mixed workloads. The processing complex has four Intel E5-2620 CPUs (24 cores, 2.0 GHz – the same as the FS1-2) and 384GB of RAM cache/32 GB NV-DIMM. There are between four and 12 host ports (2 to 6 HBAs) of 16Gbit/s FC and 12 storage ports (six 6Gbit/s 4-lane SAS-2 HBAs). This FS1, "co-engineered with Oracle Database and Applications," supports Oracle's hybrid columnar compression (HCC), delivering, Larry & Co says, up to a 10:1 reduction ratio on encrypted Oracle databases – a feat which EMC's XtremIO, Pure and others can't match, as they can't run HCC. It also, the company says, compresses data up to 50x, speeds queries up to five times, and reduces the storage footprint by three to five times. Oracle says the array can provide "application development teams with unlimited real-time database copies," which sounds like a riposte to data virtualiser Delphix and its copy data reduction facilities. As with the FS1-2 there are pre-defined "application storage profiles that provide flash-tuned, out-of-the-box storage optimization for Oracle Database and Oracle Applications, as well as for non-Oracle enterprise applications." One-click provisioning is mentioned and we're told the Oracle Database application profile "provisions database components—such as index files, database tables, archive logs, redo logs, control files, and temp files—automatically optimising Oracle Database performance without requiring detailed knowledge of the database components." It sounds like a godsend. App profiles can be extended, or created and applied to other all-flash FS1s. Oracle's announcement material positions the all-flash FS1 against hybrid flash/disk arrays, and therefore against its own hybrid FS1-2. Also, and specifically, against EMC's XtremIO system. With it pretty obviously being an all-flash implementation of the hybrid FS1-2, it reminds us of Tegile's 2-tier flash array product, the IntelliFlash with 512TB of capacity in a 3U box (270.6TB/U); much denser than the all-flash FS1 and its maximum 30.4TB in 2U (15.2TB/U). Why is the all-flash FS1 so laughably poor in TB/U density terms? Let's just remind ourselves of some mainstream all-flash array competitors now: Dell, EMC, HDS, HP, IBM, Kaminario, NetApp, Oracle, Pure Storage, Tegile, Tintri, SolidFire and Violin Memory, not to mention second tier ones like Fujitsu, Mangstor and others. These suppliers are looking towards the wholesale replacement of dual-controller and monolithic old-school arrays in the primary data storage space over the next few years. It is a ferociously competitive market with incumbents using every trick in the book to repel both their existing competitors and the startups. FS1 pricing is said to provide "the most efficient $/GB/IOPS and the lowest entry price of any all-flash enterprise-class storage solution." Without actual prices, or, indeed, IOPS, there's scope for wiggle room here as what exactly consitutes an enterprise-class system is up for debate if Oracle wishes. The statement doesn't mean necessarily that Oracle might match or beat, for example, Dell's entry-level all-flash SC-series pricing. We haven't seen any mention of replication in the system or active:active failover between the controller nodes – this data sheet (PDF) doesn't mention them. But the FS1-2 has active:active controllers and a MaxRep replication engine (PDF, spec sheet), so it would be odd if these features had not been carried through from the hybrid FS1-2 to the all-flash FS1. Oracle has ESG senior analyst Mark Peters saying "This is is not just an upgraded version of an existing product; it is a complete rebuild from the ground-up, designed to take advantage of all that flash storage offers." We respectfully disagree. The all-flash FS1 uses the same dual-controller design as the hybrid FS1-2, the same size and type of SSDs, the same flash capacity, the same 30 x 2U drive enclosure expansion limit, and many of the same software features, such as domains and application profiles. To say it's a ground-up rebuild strikes us as nonsense. Think of it simply as an updated hybrid FS1-2 with the disk drive enclosures removed.